A week in the scenic French Alps seems to have done wonders for France who now have a healthy Williams Gallas and a vastly improved mood in the camp. France left their picturesque base on Tuesday having finalised a 23-man squad for the month-long tournament in South Africa and in confident mood after many concerns were overcome. "It went really well," forward Nicolas Anelka said before packing. "We're happy to be together, we worked hard both physically and tactically and now we're impatient to translate all that on the pitch." 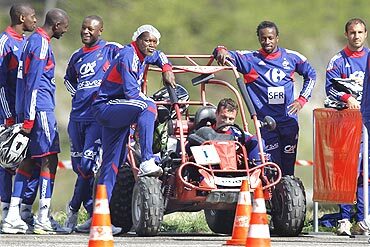 Coach Raymond Domenech, who has been under fire since his side's Euro 2008 flop, organised several strange group activities in search of harmony such as a hike up a glacier, an introduction to biathlon and even a dune buggy race. The players loved it, even Gallas who survived a fright when his buggy rolled over, and all the players said they could feel a genuine team spirit blooming. "We had gorgeous weather, which is important, and we worked extremely hard," Domenech said. "What the players showed every day in training is interesting and so is the way they've been living together. We can feel that a group is shaping up." Domenech, the man France fans love to hate, even cracked a few smiles and did not lose his cool even when midfielder Lassana Diarra was ruled out of the June 11-July 11 World Cup finals by illness on Saturday. The coach eventually decided late on Monday that Diarra would not be replaced after seeing defender Gallas, who had been doubtful because of a sore left calf, train without any problems. 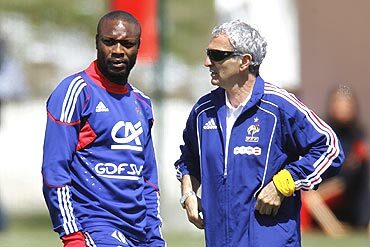 The coach, who had brought 24 players to Tignes because of concerns about Gallas, found himself with 23 after Diarra left and decided that group would travel to South Africa after Gallas was ruled fit to play. "Those 23 players will take us all the way," Domenech predicted. Saying France, who needed an infamous Thierry Henry handball to qualify through a playoff at the expense of Ireland, will win the World Cup may seem a little premature. The mood in the ski village, surrounded by rugged snow-capped peaks but almost like a ghost town in the spring, has surprised many observers. All the France players said they had fun together and were determined to soon prove their worth on the pitch. Such statements were hardly ever heard before Euro 2008, where a miserable atmosphere and a rift between the younger players in the squad and the more experienced ones marred a campaign that ended with a group-stage exit. Domenech, who will be replaced by Laurent Blanc after the World Cup, may feel he has no pressure, with French fans and media generally feeling the team has no chance to make an impact on the pitches of South Africa. The coach even made a bold move in the penultimate training session in Tignes, fielding a 4-3-3 formation instead of his preferred, more defensive 4-2-3-1 system. The fans watching the session applauded, hoping the cautious tactics that have frustrated them for years might soon make way for a more exciting brand of football.